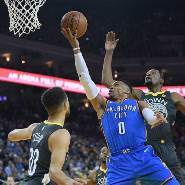 On Saturday the Oklahoma City Thunder will visit Oracle Arena brandishing a 2-0 head-to-head record against the Golden State Warriors this season. The Thunder will try to improve to 3-0 against the Warriors in their second visit to Oracle Arena. The last time Oklahoma City visited Oakland the Warriors never had a lead as they lost 125-105 and back in November they fell 108-91 back in Oklahoma. No team has beaten the Warriors three times in a season since Steve Kerr became their head coach, setting this for what should be an amazing matchup with playoff atmosphere as the Thunder looks to win its third straight NBA game. For the Thunder’s players, this is a crucial game as they look to get a huge confidence boost ahead of the playoffs to prove to themselves that they can beat the Warriors in a long series and take the season series from them. The Warriors will need a full effort if they want to win this game. Specifically, they need to be sharper from the floor and from three-point land. In the last two games against OKC Klay Thompson and Draymond Green have shot about 30 percent and that can’t continue if Golden State wants to stop the losing streak. Kevin Durant has averaged 27 points while shooting 51.6 percent from the floor in the two games against his former team this season, but the most damaging issue to the Warriors in those games has been turnovers. They averaged 23.5 turnovers in those two games, leading to a total of 70 points for the Thunder. On the other side, Russell Westbrook and Paul George have combined for 63 points, 17.5 rebounds and 11 assists against Golden State this season. Statistically, the most attractive matchup is the one between Golden State’s offense, which is scoring 116.2 points per game (ranked No. 1 in the NBA) clashing against a Thunder defense that is allowing 103.3 points per game (ranked 6th in the NBA).